It’s Saturday, so it’s time for the next part of our Flash Gordon rewatch. Things were looking pretty bad for Flash and Dale at the end of last week’s episode – The Tunnel of Terror. Dale had been put into a trance using the dehumanizer and Flash had just fallen unconscious having been caught by a giant crab-parrot-Godzilla thing. I’ve got a feeling things will be okay (at least for a while) so grab some popcorn and your favourite beverage and let’s watch Chapter 3 – (spoiler) Captured by Shark Men. I was right! 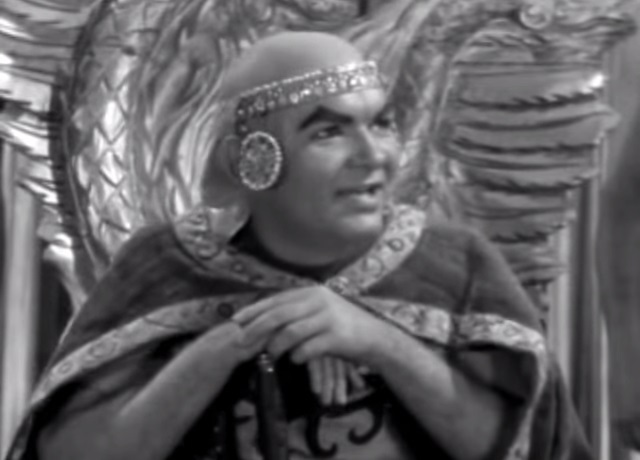 Prince Thun comes to Flash’s rescue and kills the giant parrot with a “raygun”. Flash and Thun prevent the final stroke of the sacred gong from sounding, in the process stopping the wedding between Dale and Ming. They rescue Dale and flee, vandalising a religious idol along the way. To Princess Aura’s chagrin, Ming orders the use of the water trap. Flash and Thun (and the still-entranced Dale) are (again) cornered by Ming’s men and (again) Thun sacrifices himself to allow Flash and Dale to escape, but as Dale returns to her normal self, a trap door opens, plunging them into water and the waiting arms of the Shark Men. Princess Aura finds Thun and they go in pursuit of Flash and Dale. After a fair amount of splashing around, the shark men finally overpower Flash and Dale and take them to a submarine. As the craft travels to the city of the shark men, they encounter a deadly “octosack”. 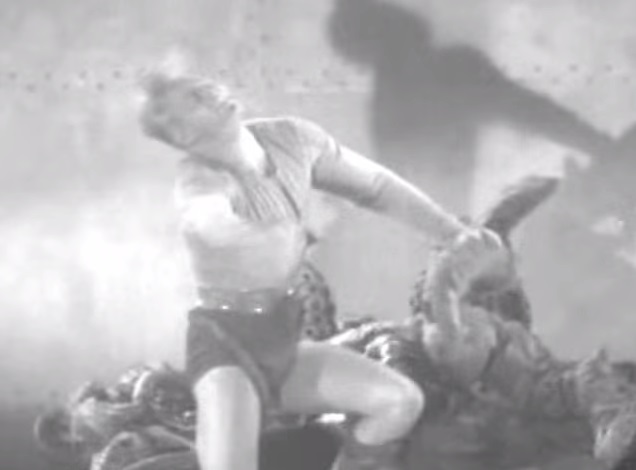 Fearful for their safety, the crew give Flash and Dale underwater breathing helmets, but the creature becomes embroiled in a fight with a shark and the submarine is able to pass unscathed. Flash and Dale are taken before Kala, king of the shark men. Flash cunningly goads Kala into a fight and, eventually, defeats him – making Flash the first man to defeat King Kala in hand to hand combat. Flash has earned their freedom, and Kala agrees to set them free, rather than deliver them to Ming. Sadly, that Kala is a shifty son of a shark and betrays them. Flash is thrown into a cell and Dale is put in the least private, private room ever. Dale realises something is up and escapes (walks out) of her room. She catches King Kala on the “spaceograph” to Ming and discovers that Kala is filling Flash’s cell with water. To her horror, Kala unleashes an ocotosack and the episode ends with Flash trapped in its tentacles. Will Flash drown before Dale, Aura or Thun can save him? 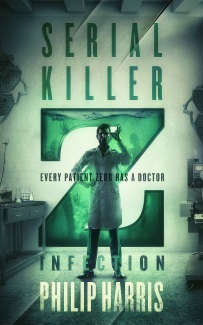 Will the dastardly King Kala send Dale back to Ming and his dehumanizer? Only time or YouTube will tell. This is the first chapter of the series, that “cheats” to get Flash out of trouble. The opening of the chapter doesn’t match the ending of the previous one – additional scenes are inserted that reveal that Thun has fought off his attackers and has a weapon he can use against the parrot. It’s the sort of trick that upset Annie Wilkes in Misery. I don’t know if there was an assumption that audiences wouldn’t remember the details of the ending of the previous chapter or if the film-makers just didn’t care, but I certainly spotted it as a kid. There’s also some attempt at foreshadowing here. 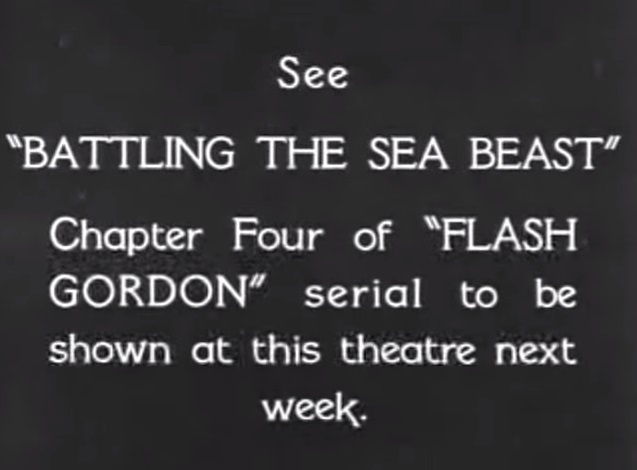 Apart from the fight between the octopus – sorry, octosack – and the shark, Flash also states that he’s going to learn how to operate the shark men’s submarines because it “might come in handy.” I’m guessing it does. I’m also hoping Dale will do something to help Flash deal with the octosack – she’s been the epitome of a damsel in distress so far. The battle between Flash and the octosack is the winner this week. King Kala – quick to anger, devious, and a nifty outfit – what’s not to love? Find out if Flash Survives in Chapter 4 – Battling the Sea Beast. The cliffhanger ending to Chapter 3 is one of the best in this serial and even one of the best overall among the three Flash Gordon serials. I think the best Flash Gordon cliffhanger ending was Chapter 1 of Flash Gordon Conquers the Universe, though it is not my personal favorite. 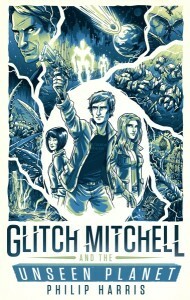 The characterization in this serial is one reason why it was so successful. Just about every character was played to perfection and King Kayla was no exception.